What is fascism? By focusing on the concrete: what the fascists did, rather than what they said, the esteemed historian Robert O. Paxton answers this question. 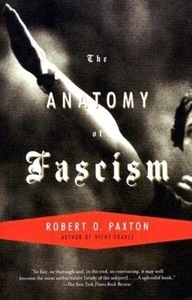 From the first violent uniformed bands beating up "enemies of the state," through Mussolini's rise to power, to Germany's fascist radicalization in World War II, Paxton shows clearly why fascists came to power in some countries and not others, and explores whether fascism could exist outside the early-twentieth-century European setting in which it emerged. The Anatomy of Fascism will have a lasting impact on our understanding of modern European history, just as Paxton's classic Vichy France redefined our vision of World War II. Based on a lifetime of research, this compelling and important book transforms our knowledge of fascism-"the major political innovation of the twentieth century, and the source of much of its pain."